The Invicta Dynamos fell to a sizeable defeat in their penultimate league game of 2017/18 as they lost out 10-1 on the road at the hands of the title chasing Basingstoke Bison on Saturday night. Head Coach Kevin Parrish was without the services of D-man Ross Connolly and forward Jake Stedman but was able to recall netminder John Dibble as back-up netminder. The Mos actually started the game well as 16-year-old George Hoang made home netminder Dean Skinns work to save his early shot. 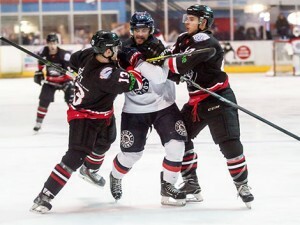 Damien King was then called into action by denying Josh Smith before the Mos were on the penalty kill after Ashley Jackson was penalised for hooking on 4 minutes. The visitors rallied hard together and restricted the Bison to only 2 shots on the powerplay to leave the sides still tied at 0-0. The kill switched over moments later with Ivan Antonov called for high sticks and the Dynamos almost crept ahead with Steve Osman picking out Mason Webster at the far post but Skinns did well to recover the puck. A routine save by King then stopped Dan Scott from putting Bison ahead and when possession changed to the other end of the ice Louis Colvin squared to Hoang who hit a first-time shot which Skinns saved well. Bison finally made the breakthrough on 14.07 – Tomas Karpov and Smith combining to find Aaron Connolly who cut in from the right to beat King for 1-0. Basingstoke then doubled the lead in the 17th minute – Daniel Davies getting his first goal of the evening after latching onto Antonov’s pass. The 2nd period killed the game for the Mos. It didn’t get off to the best of starts when the Bison went 3-0 up on 20.24 – Connolly roofing past King’s left shoulder with assists coming from Baird and Smith. A minute later Davies grabbed his second of the night and the home side’s fourth which prompted Kevin Parrish to call a timeout. The talk did little to change the momentum however as the Bison continued to attack the Mos and they were soon 5-0 up – Ryan Sutton hitting the net. Daniel Davies completed his hat-trick in the 25th minute after feeding off a Karpov pass and dispatching beyond King for Bison’s sixth goal. King then denied Davies his fourth goal before the Mos ruined the Bison’s hope of a shutout – Mason Webster teed-up Steve Osman nicely to stroke the puck past Skinns for 6-1 on 30.42. That was pretty much as good as it good for the Mos that period with Basingstoke going 7-1 ahead on 31.46 through Ivan Antonov. Then, just before the end of the 2nd period, the scoreboard was displaying 8-1 – Kurt Reynolds scoring. Invicta changed netminders for the final period with John Dibble replacing King. Remarkably the Bison hit the post three times early in the frame but the Dynamos had a few chances too through Ondrej Zosiak and Jaroslav Cesky which were both saved. The Mos defended Dibble’s net well until the 57th minute when Karpov notched a goal for 9-1 and, with the game closing out, Basingstoke hit the final goal of the game on 59:58 through Karpov again for 10-1. Man of the match for the Dynamos went to Mason Webster whilst Daniel Davies received the honours for the home side after bagging a hat-trick and 3 assists.